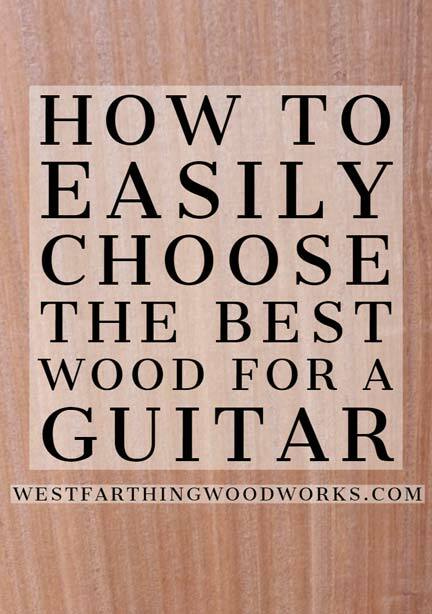 Are you nervous about choosing the best wood for a guitar? The wood does make a difference, but thankfully it’s easier than you may think to choose the best. In this guide, I’ll show you everything you need to know, and some things to avoid too. Enjoy. All guitar makers are obsessed with their wood. 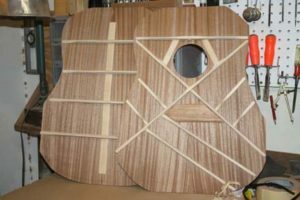 After all whether or not you are making an acoustic guitar, or an electric guitar, the wood choice matters. The species can make a difference in the warmth, sustain, and tonal qualities in the final instrument. For the careful guitar maker, the difference from one guitar to another can come down to the wood used in the build. Now, while picking out wood is important, it’s also important to avoid some things. These are more universal across the different species, and they will help you ensure that the piece of Sapale you are looking at is the best one in the bin. It’s not just about getting a certain species. It’s about getting the right board every time. Here is how you do it. First, it’s more important to teach you how to find the very best piece than it is to talk about species just yet. The quality of the board you find is far more important than the species. Avoiding problems is the key. Even in cases where a species may be considered poor quality for a guitar, it can actually end up being better than a more traditional species choice. If that traditional wood choice has a lot of problems, it may actually make a poorer guitar. Defects. Make sure that when you buy your board, it’s free of defects. Warp. If your board is warped, and you can’t mill it flat again, don’t buy it. Cracks. A board that is cracking will tend to continue cracking. Wet Wood. Wood that is not well seasoned will not make a good guitar. Grain Direction. Quarter sawn wood is the better than flat sawn in most cases. Run Out. Look for the grain lines to run from end to end without any sudden turns. Dead Tone. If a piece tones very poorly, leave it behind. That’s a sign of damage. When you decide on a species, which we will get into farther down, you need to pick out the best piece in the bin. This is actually a more important skill than knowing the species. It’s important that if you are going to pay the same, you get the best. When you get down to making a decision, start with the hardest of all factors to find in a wood store. That is the grain direction and orientation. Most hardwood stores sell flat sawn wood. This means that there will only be a small amount of quarter sawn. 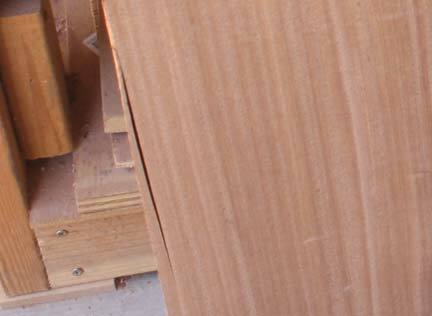 Quarter sawn wood is where the grain lines run perpendicular to the faces of the board, and makes the board stronger. Start by identifying and removing these boards from the bin, and making yourself a small pile. Second, look at each piece and discard any that are not flat, and feel wet. You are now going for the second rarest factor, which is a straight, dry board. Once you have those in one place, put back the rest that don’t qualify. Now, examine each board and toss any with defects that you can’t work around. Those can be knots, cracks, checks, color stains you don’t like, and anything else that is not normally seen on the board. Finally, of the boards you like, tone them to hear their vibration. As long as they all vibrate about the same, then simply pick the one that looks the best. You might even take home all of them if you have a few great looking boards. Before I get into the best tone wood, and the best tonal properties of the wood you choose, you need to know something. The best wood in the world will not save a crappy build. It does not matter how exotic, expensive, or rare. If you build poorly, you might as well make the guitar from MDF. Now, since you control the build, you also control the quality. In my experience, poor quality builds don’t come from poor quality humans. They come when you are rushing, cutting corners, and not taking the time to do it right. 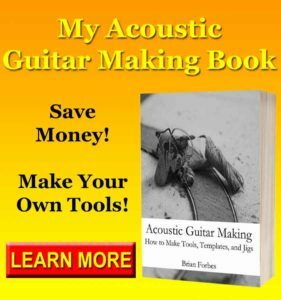 Making a guitar is just like any other woodworking project. It’s not really that hard when you get right down to it. It’s just a lot of small steps and that’s too much for some people to handle. I’ve never met anyone who was just a bad guitar maker. The poor performing guitars have always been from lack of patience. Instead of taking the time to do it right, they just rush all the time, and the end results look that way. 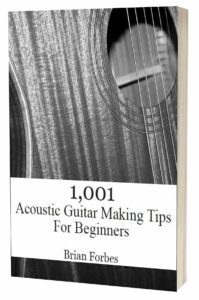 That should be great news for you, because it means even a beginner can make a good guitar. You only need to have patience. 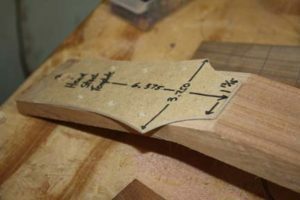 Guitar necks need to be strong, and they need to hold up against tension. The neck also needs to remain as still as possible while the strings vibrate. This is where you get your sustain, and keep your sound. Look for Mahogany, Sapele, Rosewood, and Maple as good starting points. All of these woods are strong, and they are traditional. There is a reason that 99% of the guitar necks in the world are made from these few species. They have the best tonal characteristics too. Above all, a Maple neck is the most common in electric guitars, and the Mahogany neck is the most common in acoustic guitars. Heavier wood in general will give you more sustain. Lighter necks have a harder time overcoming the vibration of the strings, and they can wiggle more. A denser neck stays still better, meaning you have a better sounding guitar in most cases. For fretboards, you need a type of wood that is dense and strong. The dynamic range and tone properties from the fretboard is not as influential as on other places on the guitar, so you get a little more wiggle room. Pick something dense, so it holds up to being played a lot. Then, pick something beautiful from the dense choices. Good choices include Easy Indian Rosewood, Ebony, Bocote, Cocobolo, Bubinga, and Wenge. Most electric guitars are made with Swamp Ash, Alder, or even a mixed pile of random wood glued together. While these work great for the mass market, you can do a lot better as a private guitar maker. You can also get a lot of look without a lot of money by doing a drop top. This is where you use a less expensive species for the back of the guitar, and then glue on a 1/4 inch thick piece of something flashy for the top. Some pieces of drop top wood have insane grain patterns. These can be really expensive if you had to buy a whole block, but the small piece you need for the drop top is far less expensive. For the tone, a softer piece of wood like Mahogany will give you a warmer tone. Harder species like Maple will give you a brassier and brighter tone, and more sustain. It will also be a lot heavier, which may not may not make you comfortable. The drop top is a good compromise though, because you can use a denser species for the top, and a warmer, softer species for the back. With acoustic guitars, the wood choice has a more profound effect on tone. 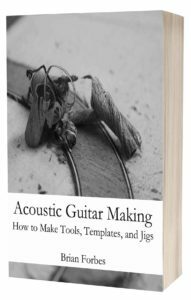 The build is still more important, but you don’t have the benefits of amplification and processing with an acoustic guitar that you have with an electric guitar. Keeping it traditional, look for a Spruce top with tight grains, and densely packed lines along the top of the board. You can have wider lines, as long as they are evenly spaced across the board. You can also use Douglas Fir, or Mahogany. Neither have the same strength to weight ratio as Spruce, but will need different bracing because they will not vibrate as freely. For the back and sides, the two main choices have long been Mahogany and Easy Indian Rosewood. The former making a warmer guitar and the latter a guitar with more of a brass like tone that is sharper. You can also use Padauk, Bubinga, Goncalo Alves, Bocote, and Zebrawood. All of these are great looking species, and they all make good sounding guitars. When it comes to species, there are a lot of ways that a beginner can choose the right species. It all comes down to track record, and because of that reason, you should rely on the experience of others rather than taking chances. The easiest way to find the best body wood or neck wood is to just look at existing guitars and see what they are made from. You need to go a little deeper though. You need to search by what you want your guitar to do. 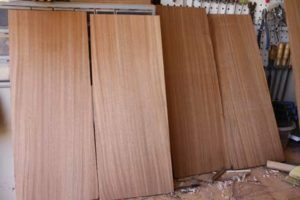 For example, if you are looking for tone wood that has good sustain, or a strong mid range, then simply search for wood types like that. Some other builder has already discovered that denser woods sustain better than softer woods. Don’t experiment. Just use the wood that they use. It’s foolish to think that you can experiment and overcome the thousands and thousands of guitars that private makers have already built. They already did all the work, just use the same kinds of wood for the same reasons, and you will be fine. For the best bang for your buck, there are types of wood that are not widely used, yet they make excellent guitars. These are the hidden gems in guitar making, and they can set you apart from other makers. Padauk. This is a red wood from Africa, and it’s a bold color choice. It’s also a dense, hard wood that reflects sound really well as a back and sides. It can be used in electric guitar bodies as the base or the drop top as well. Bubinga. The density of Bubinga is amazing, and the wood is heavy. It works really well for back and side sets, and can also make a nice guitar neck. If you find a well figured piece, you can use it for a drop top that will get a lot of attention. Goncalo Alves. Also called tiger wood, Goncalo Alves is dense, heavy, and darkens with age and exposure to sunlight. It makes a great looking back and side set, and when cut properly it has a lot of cool color streaks. Sapele. When you see Sapele, you will be surprised that the price is so low. It works well on all kinds of guitars, necks, and fretboards. 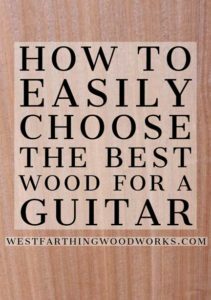 Now that you know what to look for in a piece of guitar making wood, it’s time to head on over to the wood store and pick something out. Take this guide with you, and make sure to you avoid the problem pieces. As you stand in front of the bin that you want to buy from, because you love the species and the color, start your selection process following the guide from earlier. Look for well quartered pieces that are straight and dry. Then, discard any with defects that you can’t work around, or wood that sounds dead and lifeless when toned. After that, pick out the pieces that look the best in your eyes, and bring them home knowing you made a good choice. If you have any questions on How to easily Choose the Best Wood for a Guitar, please leave a comment and I will be glad to answer them. Happy building.